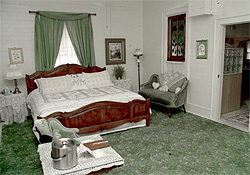 Historic Cedar Key Bed & Breakfast was built in 1880 as the Eagle Pencil Company superintendents residence and guest house. 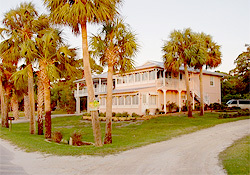 We are located in the island city of Cedar Key, FL on the Gulf of Mexico about 120 miles North of Tampa. 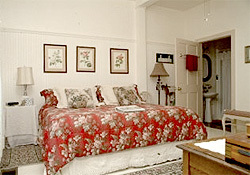 We offer 7 wonderful rooms and 2 awesome suites all with central air/heat, ceiling fans and private baths and the most comfortable beds this side of heaven! We serve a full-course gourmet breakfast each morning along with an unlimited supply of steaming hot coffee, teas, hot chocolates, juices and breads. Homemade chocolate chip cookies does not do justice to our signature cookies waiting for you in our famous Bottomless cookie jar. Our yard is private and shaded with ancient live oak trees. Stroll through our beautiful butterfly garden. Enjoy our Gulf of Mexico view, fresh breezes and the spectacular Cedar Key Sunsets from our veranda. There are many things to do including: Bird watching, Kayaking, Canoeing, Boating, Cruises, Fishing, 2 Museums, Shopping, Wonderful Seafood Restaurants, Live Entertainment on weekends, Festivals, close by natural springs and Relaxation! Your rocking chair is waiting for you on our veranda. 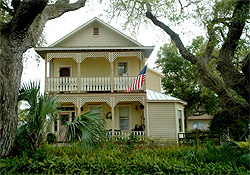 Kick back and enjoy Historic Cedar Key, the place that time forgot. 1 Cup Jalapeno Jack Cheese, Shredded. The Amounts Of Cheeses And Spinach may be increased or decreased to satisfy your taste. Layer The Salsa, Parmesan, Spinach, Cheddar, Jack. Pour Egg Mixture Over All. Bake 15-20 Min. At 350 Then Reduce Heat To 325. Total Bake Time Approx 1 Hr. Done When Knife Inserted In Center Comes Out Clean. Serve With Extra Salsa And Dolop Of Sour Cream. All Ingredients Can Vary Depending On Taste!